Side-scanning technology enables rapid assessment of pipelines while providing the data needed to prioritize rehabilitation and maintenance. Side-scanning relies on software to manipulate video frames into a flat digital image. The length of the image corresponds to the length of the pipe and the height to the circumference, as if you pulled the pipe out of the ground, cut straight down its length and were able to lay the whole thing flat. CCTV footage is vital for maintaining sewers but is time-consuming to collect and analyze. Side-scanning lets your operator focus on doing what they do best, piloting the crawler. No need to analyze on the go or pause and zoom in. 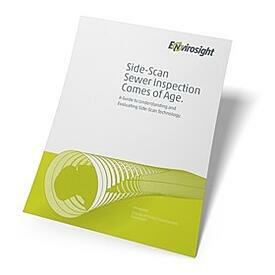 A side-scanning system can scan 50’ of pipe per minute, allowing you to get more done. Side-scanning makes analysis go faster too. 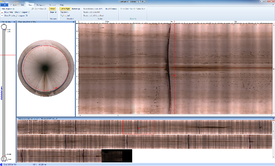 Without having to watch hours of video footage, your engineers can drill right down to the important spots, mark them up on the screen, measure flaws and correlate all that data with additional information captured along with the side-scan (like temperature and inclination). Side-scanning gives municipalities a deliverable that is easy to share, archive and revisit whenever needed.